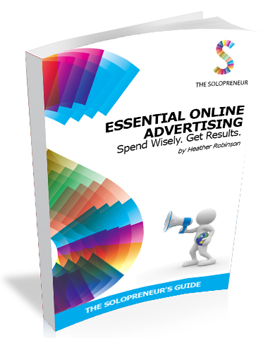 It is with great pleasure that I introduce to you my latest publication Essential Online Advertising: Spend Wisely. Get Results. The book has been written with the knowledge I have acquired helping businesses with digital marketing over the last 9 years and through the training I do with many small businesses and solopreneurs. I get asked lots of questions about paid advertising and whether it can benefit the small business and sole trader, so here's a pocket guide that will hopefully answer all those questions and concerns! In this easy-to-digest format, I cover the fundamentals of Google AdWords advertising as well as social media advertising on Facebook, Twitter, YouTube and LinkedIn. Each chapter is dedicated to answering a common question many small business owners have when they begin looking into the often confusing world of paid advertising. 1. Does advertising on Google AdWords and social media work for every industry / business / product / service? 3. How can I make sure I get the best results for my budget? 4. Which platforms are the best to use for my business? 5. How do I know if a campaign is performing well? 6. How do I optimise my campaigns for better results? If you've ever asked any of these questions, this book is for you, whether you're a coach, consultant, web designer or any other 'solopreneur'. If you've already bought the book, I'd love to hear your feedback in the comments below. Older PostComment SPAM - still a recognised SEO technique?